Harry Levin’s Memories of the Moderns, originally published by New Directions in 1980, is now presented in New Directions Paperbook format. 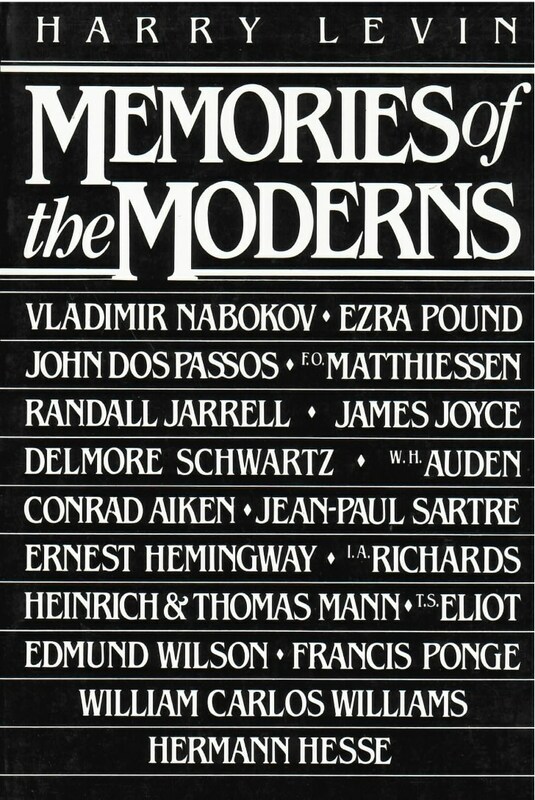 This gathering of prose pieces––reviews, essays, lectures, introductions, personal recollections, and epistles, written for the most part during the 1970s––combines criticism with reminiscence and is both an exploration of the idea of modernism within the international frame of comparative literature and a valediction. By now, what was so avant-garde, experimental, difficult, and sometimes shocking in the writings of the twentieth-century modernists has permanently altered our literature––the groundbreakers have become our classics. Discussed here are Ezra Pound, T. S. Eliot, James Joyce, Heinrich and Thomas Mann, Hermann Hesse, Ernest Hemingway, John Dos Passos, William Carlos Williams, Conrad Aiken, Jean-Paul Sartre (writing on Flaubert), Francis Ponge, W. H. Auden, Delmore Schwartz, Randall Jarrell, I. A. Richards, Edmund Wilson, Vladimir Nabokov, and F. O. Mathiessen. There is as well an opening letter to James Laughlin, who published Harry Levin’s seminal book on James Joyce in 1941.